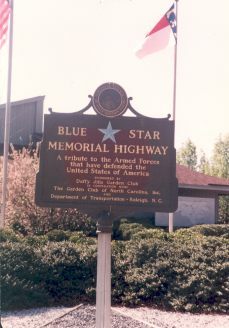 The Blue Star Memorial Highways are a tribute to the armed forces that have defended the United States of America. The National Garden Clubs, Inc., is the parent organization for Blue Star Memorial Highways. The idea dates to 1944 when the New Jersey State Council of Garden Clubs beautified a 5½-mile stretch of U.S. 22 from Mountainside to North Plainfield. Approximately 8,000 dogwood trees were planted as a living memorial to the men and women in the Armed Forces from New Jersey. The Blue Star, taken from the blue star in the service flag, was chosen to symbolize the memorial because it was used during World War II on flags and homes of families that had a son or daughter in the service. The New Jersey Legislature approved a Joint Resolution on January 22, 1945, designating this highway "Blue Star Drive." The start or northeast end of the Blue Star Drive in Mountainside is at the Locust Grove Union Chapel. There a roadside sign has been erected to signify its dedication. Completed in 1932, the route has dual concrete roadways, each 20 feet wide, with 10-foot shoulders on the outside that have a slope of ¼ inch to the foot. A system of catch basins along the ditch line provides adequate drainage. The dual roads are separated by a planted area that varies in width according to the right-of-way available. However, the average right-of-way width is only 100 feet. This means that the roadside strip beyond the shoulder on each side is only about 10 feet wide. So in order to have adequate space for planting, the State sought permission from owners of abutting property to put dogwoods on their land. For the most part cooperation was excellent, since the property was improved at no cost and with no strings attached to the benefit . . . . The project really started in the autumn of 1944 when about 2,000 dogwoods were planted along this road. Those trees, as well as the ones planted this year, were purchased with funds raised by the Garden Club of New Jersey from donations by corporations, organizations, clubs, and public-spirited individuals. All future trees will be purchased in the same way. A 5-foot nursery-grown tree can be planted on Blue Star Drive for approximately $1. A donation which does not specify the exact number of trees is used to plant an area with trees and shrubs of varying size to fit a landscape design. As this four-lane highway is one of the great traffic arteries between New Jersey and other states, it is estimated that 29,000 cars will pass the memorial daily . . . .
At the close of World War II, the National Council, like other public-spirited groups, was seeking a suitable means of honoring servicemen and women. It was agreed, that as Garden Clubs, it would be better to help beautify and preserve the country the men had fought for than to build stone monuments. The New Jersey clubs had just finished beautifying a section of one of the New Jersey highways as a War Memorial, working with the New Jersey Highway Commissioner, Spencer Miller, Jr., when Mr. Miller, a guest speaker at the annual convention of the National Council in 1945, suggested that this program be projected on a nationwide basis. This was just the kind of project the National Council had been looking for. Using the New Jersey project as its model, the National Council made a study of the inter-regional highways of the United States. A Blue Star Highway system was outlined, consisting of one east-west and seven north-south highways. (Today we have many more.) Highway Commissioners were informed of the plan as were also the Garden Clubs in each state, and all were invited to participate. Every State President was asked to secure collaboration of the State Highway Department before undertaking a Blue Star project, as this was considered requisite to the success of the plan. A uniform marker was adopted to show memorialization, the design of which was a gift from Mrs. Frederic Kellogg, founder of National Council. National Council has emphasized memorialization during this early stage [but] designation of the highway is only the beginning. Outline of a general beautification program through memorial plantings of native trees and shrubs, special features such as roadside rests, bird sanctuaries, playgrounds and through the elimination of blighted areas, has been prepared . . . . We urge strong protective measures also, through planning, zoning, and voluntary cooperation in improving roadside standards. The Blue Star Memorial Highway should serve as a demonstration area for ALL approved practices in Conservation, Horticulture, Safety and other fields of Garden Club interest . . . . But if we fail of full realization, we can at least go forward with the knowledge, to quote New Jersey State Highway Commissioner, Spencer Miller, Jr., "that we are helping to redeem our times and to build a civilization which is fit for free men, for we shall be helping to build America the beautiful." The original concept was expanded to honor all men and women who had served, were serving, or would serve in the armed services of the United States. According to the Blue Star Memorial Program website, "Memorial Markers and By-Way markers were added to the Highway Markers, to be used at locations such as National cemeteries, parks, veteran's facilities and gardens.